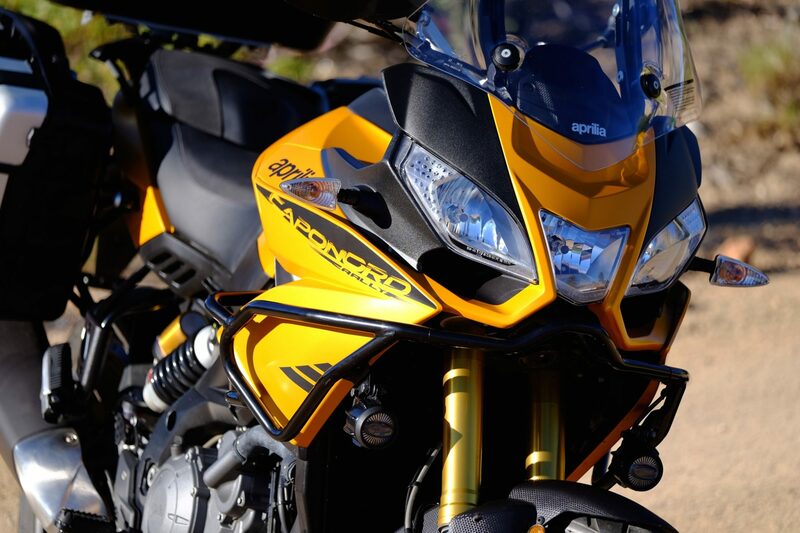 When Aprilia released their Caponord 1200 Travel Pack in the spring of 2014, they had the good sense to not lump it in with the expanding crowd of touring machines aimed at the off-road rider. Masters of tarmac, they stuck with what they know and created a platform with exceptional pavement performance, but fitted with the adventure-touring ergonomics so many riders seem to prefer these days. It was a smart move. 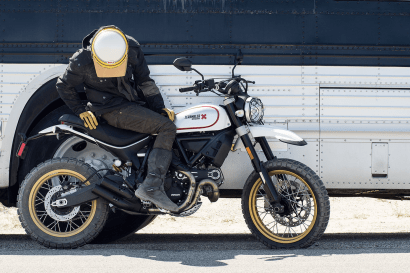 Sport touring bikes have been losing market share to the new crop of all-surface offerings, even though many of them never see dirt. 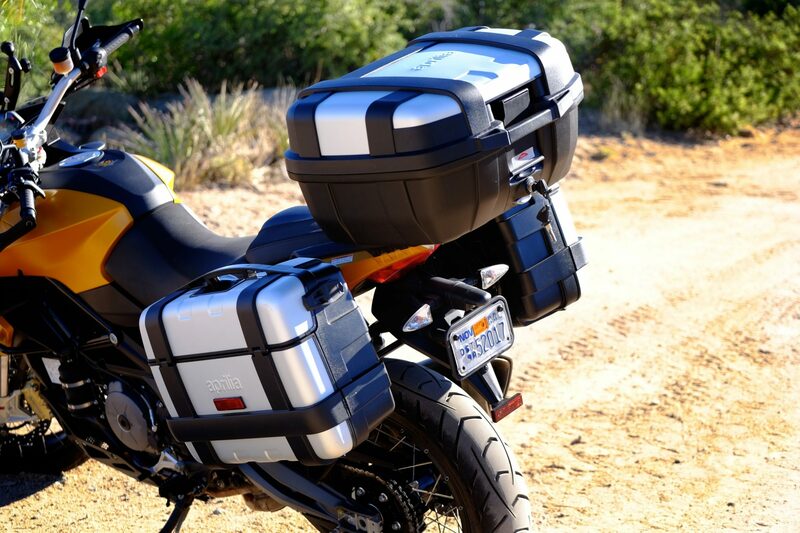 I was on the product launch of the 1200 Travel Pack and absolutely loved it. In the following year the Italian brand made a few tweaks to the Capo with the introduction of a more versatile model: the Caponord 1200 Rally. With the addition of a 19-inch front wheel over the standard 17-inch hoop, the Rally version immediately looked more adventuresome. 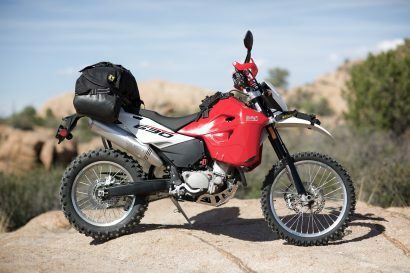 Spoked wheels, upper crash bars, and hard cases sporting a more brawny design rounded out the list of features aimed at taking the Rally down the road less traveled. All I needed to do was find that road—and I did just that. With summer just ramping up I managed to get my paws on a Capo Rally and took it on a trip I wanted to do for several years. 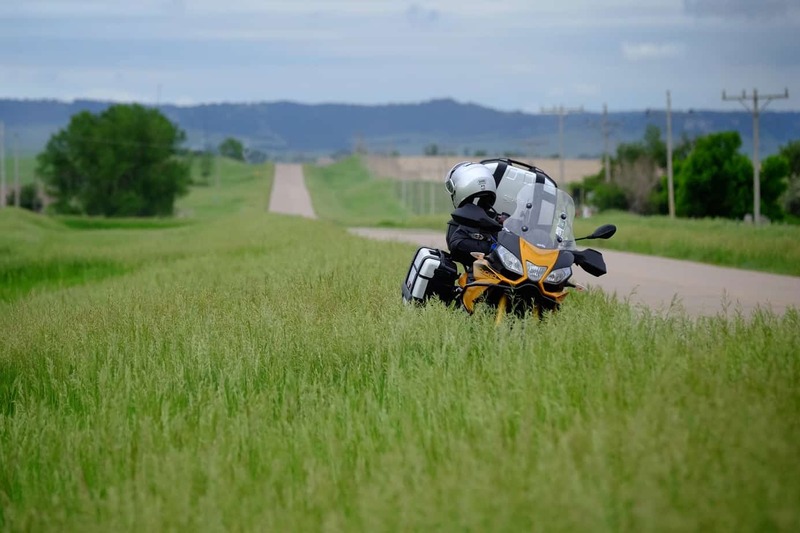 A native Kansas boy, I always longed to ride the endless stretches of small roads crisscrossing the Plains States. In between thousands of miles of gravel tracks, some smooth as silk, others extremely rugged and unkept, is an extensive inventory of small county paved roads, many of them seldom visited by our friends with badges. Remote gravel and wide open tarmac? Yes, please. 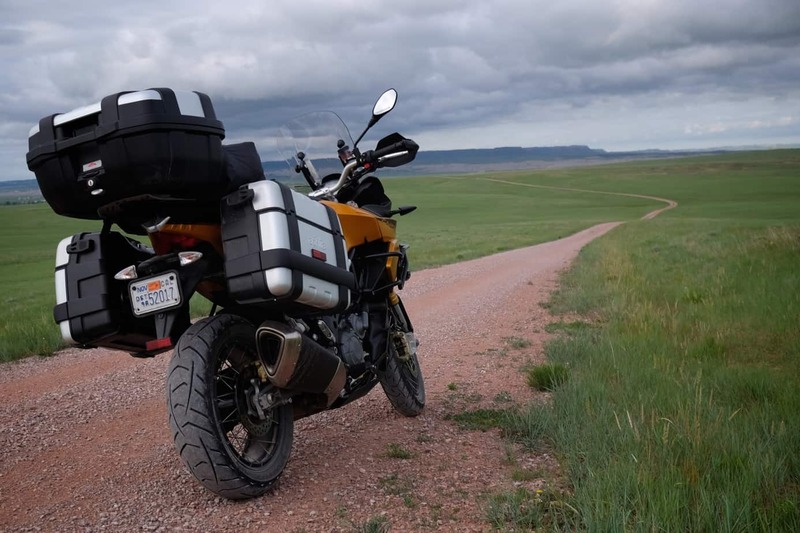 After fitting the Capo Rally with a healthy load of cameras, camping gear, food, water, and other sundries, I threw a leg over the bike and headed into the flatlands. Because I had 400 miles of chunky highway sprawled out before me, I switched out of the Sport mode and set the throttle map to Touring. I then rolled onto the highway with a fistful of grip, the 125-horsepower V-twin engine growling as I ticked through the gears. 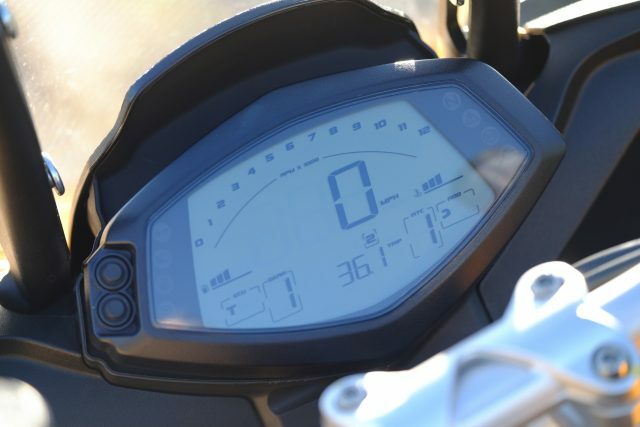 With the digital speedo indicating a casual 80 mph before tapping into 6th, I knew I had chosen the right machine for the mission. When Aprilia’s engineers set out to create their latest Caponord, they had a very focused vision for the final product. 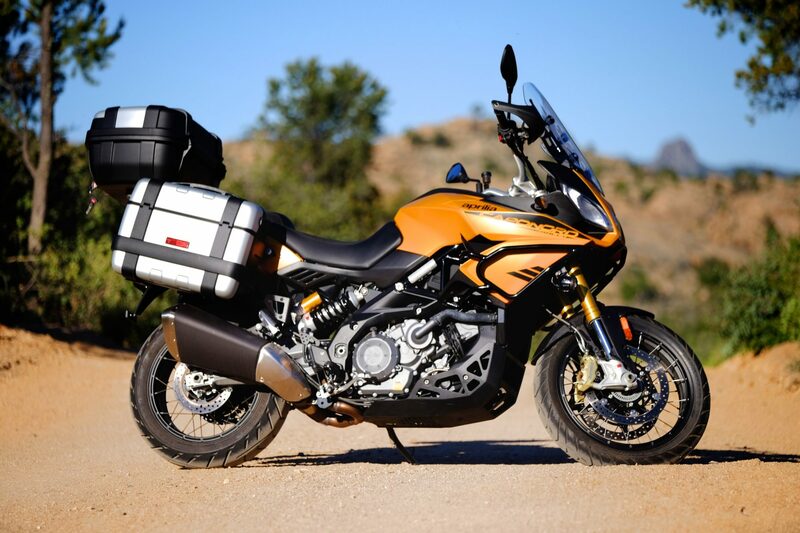 It is undoubtedly a touring bike with its tall windscreen, comfy seat, exceptionally nice hard cases with two-way openings and press-button detachment, and best of all—cruise control. It’s also wicked quick in the corners, destroys high speed sweepers, and blasts down the highway with poise and authority. It’s an extremely fun motorcycle to pilot. The skid plate, if you want to call it that, is made of high density plastic. At the heart of the Caponord Rally is a stiff chassis built around a steel trellis frame augmented with additional aluminum supports. The result is a foundation that doesn’t yield a nanometer of flex. Most noticeable in hard charging turns or high velocity accelerations down the Interstate on-ramp, the Capo holds a line with tenacity and confidence. 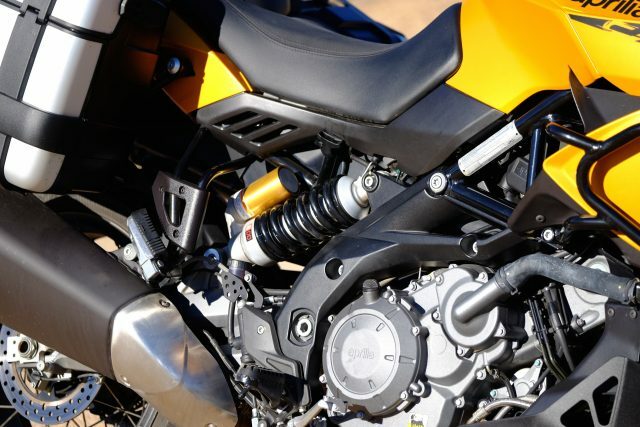 Keeping the power and comfort in perfect harmony is Aprilia’s impressive ADD suspension system. Modern bikes come with a host of customizable suspension adjustments; most of them offer equal opportunity for proper and improper tuning. The Aprilia system is set-and-forget easy. The technical voodoo magic packed within the inverted Sachs 43-millimeter fork and Sachs rear shock automatically control preload and rebound based on the road and rider conditions. 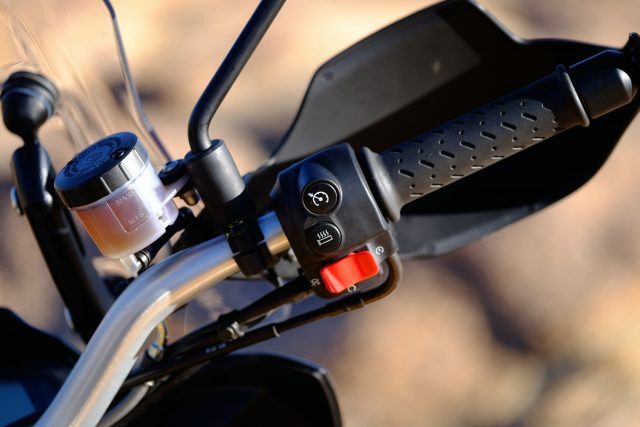 The ADD system is so advanced it monitors throttle position, chassis pitch and yaw, degree of braking, and determines the ideal amount of damping required, regardless of the chosen ride mode. It’s virtually impossible to mismanage the ADD settings. After 2 days of plying interstates and small county roads, I arrived at my first destination, the Sandhills of central Nebraska. 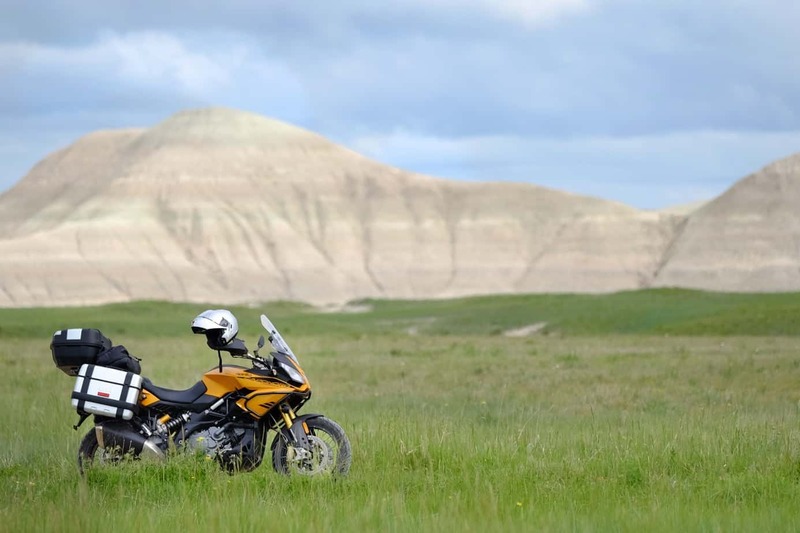 Not many adventure riders think of Nebraska as an adventure getaway, but the undulating mounds of grass-covered dunes that comprise the Sandhills extend for hundreds of miles in all directions. Within them is a massive warren of roads, and as you might have guessed, they are sandy as all get-out. I am by no means a maestro of riding soft surfaces but even after 75 miles of linear beach, I managed to keep the old girl upright. The Metzler tires were not ideally suited to the conditions, but once on harder gravel roads they worked perfectly. Like most people new to the Caponord, I wasn’t sure what to expect of the off-piste performance, and while I was impressed, I admit it has limitations. As smart as the suspension system is, there’s not much travel to it. Big bumps have to be addressed with care although it did unbelievably well attenuating the worst stretches of sharp corrugations. 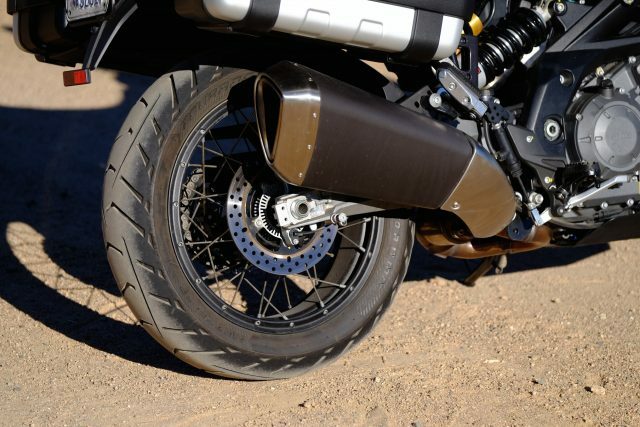 The handlebars are wide and placed high, but my one complaint was with the placement of the exhaust can so close to the right foot peg. It interfered with my heel while standing. You can file that under petty nitpicks. My only other observation was relative to the rather long wheelbase and low-slung belly. Those same attributes that make it stable on 85 mph sweepers with the cruise control locked in, make it sluggish to inputs in tight and technical terrain. On the upshot, the bike is well balanced so walking pace maneuvers are not fraught with hard or awkward yank on the bars steering commands. There’s an extensive list of things to appreciate about the Caponord Rally. The throaty exhaust note one of them. The handling, smooth transmission, and consistent clutch feel round out my list of likes. It’s also a beautiful bike to behold, the edgy lines thoughtfully joined to denote a sense of momentum even while standing still. If there is one singular attribute of the Capo I find difficult to reconcile it is the price. At only $16,500 it is a killer value. 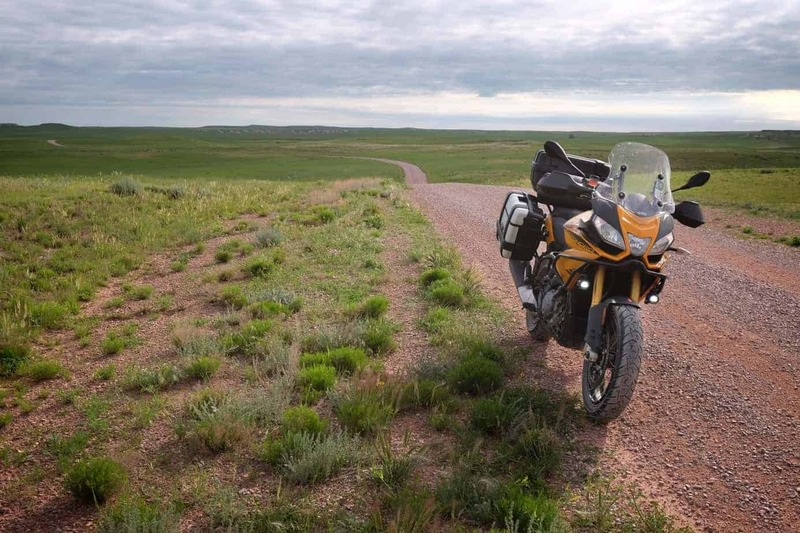 Whereas other bikes like the class dominating BMW 1200GS sell for thousands more, particularly when fitted with luggage, lights, and protection, the Rally comes standard with those features. In my humble opinion, it’s a more refined machine to boot. I concede the GS has the advantage on the dirt, but on every other metric, I’d take the Italian adventurer any day of the week. 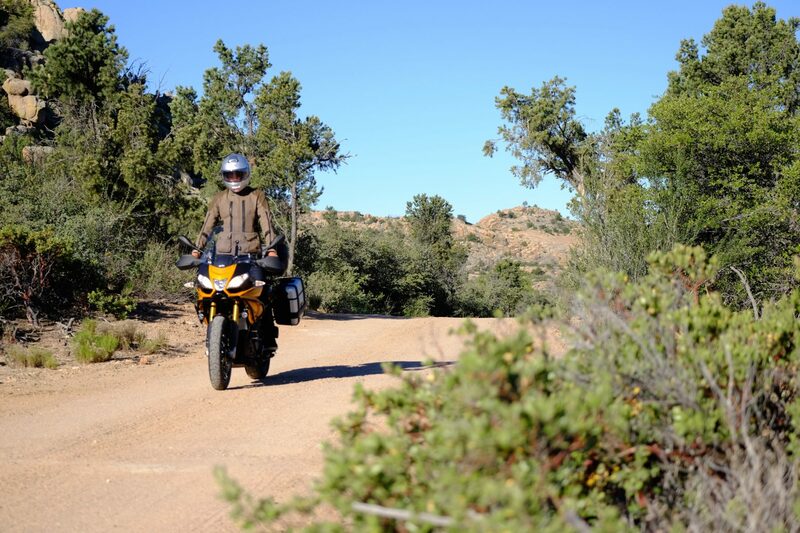 On the extremes of the adventure-themed motorcycle segment are road-biased machines like the Ducati Multistrada. 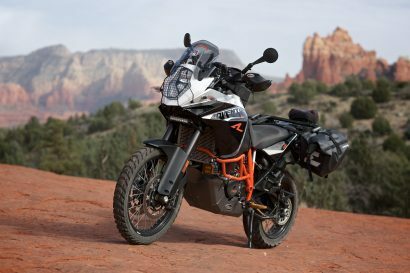 At the other end are bikes like the KTM 1090 Adventure which is very adept in the dirt. The Caponord Rally sits somewhere in between. 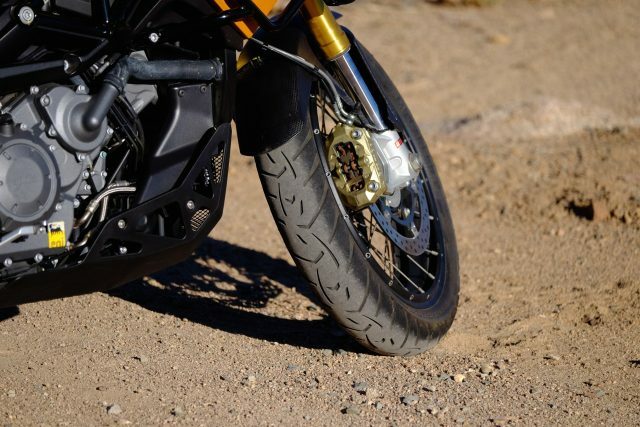 The more exotic alternative to the Kawasaki Versys 1000 or Suzuki V-Strom 1000, the Aprilia is a pavement slayer, but won’t shy away from long stretches of gravel and two-track. For those hoping to scramble over ledges, plow through rock gardens, or roost miles of sand, the Capo Rally may not bring the full weight of its name. It’s more randonee, than rally. I will be the first to admit, I’m not a brand loyalist. I don’t fawn over certain things because I’m supposed to. Products have to earn my appreciation. I know plenty of people who lust after the BMW GS simply because they’ve been told to. If I take a bike based exclusively on what it has to offer, particularly given my preferred style of touring, the Capo Rally would be my top pick.